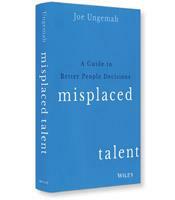 Misplaced Talent takes a hard look at the cluttered field of Talent Management, and offers a clear guide to making better people decisions in any organization. Deliberately challenging practitioners to do more, this insightful discussion sorts through the tools and techniques developed over the last century to examine their true relevance to the modern workplace. In his mega-seller Good to Great, Jim Collins famously talked about getting the right people in the right seats on the bus. In Misplaced Talent, human-resources consultant Joe Ungemah offers HR practitioners a thorough overview of the tools, techniques and frameworks required to achieve this important goal. According to Ungemah, most of these tools and techniques have not changed dramatically. “What has changed,” he writes, “is the desire and ability for organizations to question the return on investment that their people practices have on improved business efficiency, staff engagement and performance.” In other words, through the new capability to accumulate vast amounts of data, organizational leaders can determine quite accurately whether the right people are in the right seats. This puts the pressure on the HR staff and HR consultants, who are not only tasked with hiring employees who bring in the required skills, capabilities and temperament for the jobs but also with developing employees to achieve their greatest potential. The ultimate goal, writes Ungemah, is a strong employment relationship, and requires leaders to make the right HR decisions related to recruitment, responsibility assignments, staff recognition and discipline, if required, among other considerations. The first step in achieving the optimal employer relationship is to set the right criteria for the talent the organization wants to attract. Once that criterion is set, the organization must then develop the right strategies and tactics to attract the right talent. For Ungemah, that means developing a clear-cut employer-value proposition (EVP), which is then conveyed to potential candidates through an effective employer brand. Based on quantitative and qualitative data drawn in large part from interviews with current employees, the EVP details the employer promise related to a positive employment experience. The employment brand must reflect those promises through a credible, aspirational and consistent message. A high person-environment fit is achieved if, according to Ungemah, the organization has effectively applied the knowledge, skills and ability of the employees to accomplish the job tasks; the organization fulfills the tangible and intangible needs of its employees; and employees feel that the work they do is coordinated and is contributing to a common purpose. Ungemah explores the tools and techniques required to achieve each of these three tenets of high person-environment fit. For example, organizations will use a variety of ability tests, interviews and job simulations to assess the capabilities of their employees, and thus be able to apply their knowledge, skills and ability effectively. Fulfilling the needs of employees is accomplished through psychometric tests that help identify the personality characteristics, motivators and values of the organization’s employees. Ungemah warns, however, that organizations must not misuse the results from psychometrics. The last element of the person-environment fit reflects the feeling that the employees and the organization are moving in the same direction. To achieve this feeling, Ungemah writes, organizations and their employees must engage in a psychological contract, which is carefully built through the time, effort and resources that the organization invests in developing the employee. Ungemah is the opposite of Jim Collins, who has sold millions of books by building metaphors and simple yet poignant concepts that, he argues, lead to broad business success. Misplaced Talent, in contrast, is a review of human-resources tools and techniques that, for the most part, are not new or revolutionary. However, Ungemah, supported by real-world examples from the many expert practitioners he interviewed, has written a valuable manual that helps leaders transform the flash of a Collins metaphor into workplace reality.